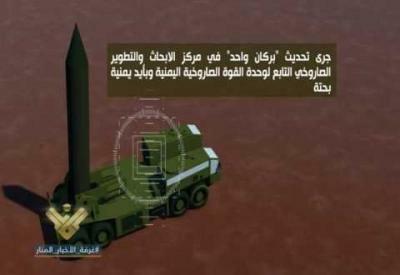 Almotamar.net - The missile force of the army and popular committees fired on Friday a new ballistic missile on Saudi territory. The ballistic Burkan-1, a Volcano, is a type of Scud missiles it has been modernized and modified to reach more than 800 KM, Its warhead weighs half a tons, its length of 12.5 M, its diameter 88 CM and its total weight is 8 tons. The Burkan's warhead is designed to bomb huge military bases. It has been modernized locally at the Missile Research and Development Center of the missile force unit of the Republic of Yemen. The missile launch came in response to the continuous aggressive airstrikes and siege on Yemen, according to a statement issued by the missile force of the army and popular committees.